Until the last twenty or so years very few Americans had ever heard of quinoa. Word about this ancient grain, cultivated high in the Andes Mountains of South America, started to spread around the 1970s. Today, it’s fairly easy for Americans to obtain. Quinoa can be used in a variety of ways and boasts a plethora of benefits. In fact, the Incas referred to it as “the mother of all grains” and according to the Whole Foods Council, research indicates that quinoa contains all of the amino acids essential to a well-balanced diet. Quinoa is a naturally gluten-free whole grain that contains nutrients such as iron, magnesium, B-vitamins, potassium, calcium, phosphorus and Vitamin E. It is also a good source of fiber. As with other whole grains, daily consumption of quinoa may help reduce a person’s risk of obesity, colon cancer, high blood pressure, cardiovascular disease and Type 2 diabetes. The most common types of quinoa are white, red and black. All are readily available in stores. It can be used as a substitute for rice, a very popular use for celiac sufferers and those who seek a gluten-free diet. The grain can be boiled or when lightly toasted it will take on a slightly nutty flavor. 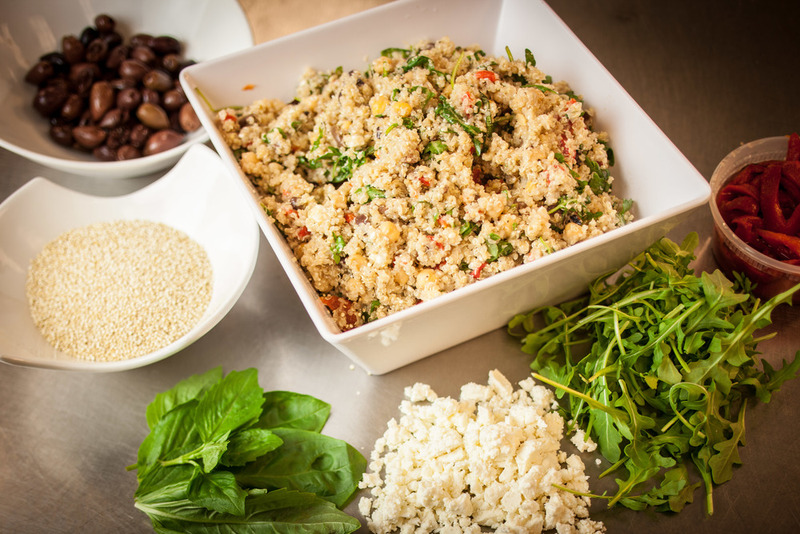 Quinoa can be incorporated into a variety of dishes and seasoned with vegetables, herbs and spices. Midtown Market Deli Manager, Evan Winters, enjoys adding Mediterranean flavors to his quinoa creations. He suggests this recipe to anyone new to cooking with the grain, as well as to those seeking something new and delicious to cook. Boil quinoa according to directions on package or until it looks like tiny "tails" appear. Drain, rinse and let cool. In a small bowl, combine balsamic vinegar, olive oil, minced garlic, dry basil and dry thyme. Whisk together until mixed well. In a separate bowl, add quinoa and all other remaining ingredients. Add vinaigrette and toss to combine. Season with salt and pepper to taste.